Harold Lendrum pulling the float. Please email rwpokorny2@gmail.com or phone Russ at 518-669-6459. 2018, Memorial Day Parades in Berne and Knox: Amy, Heather, Gerry, Nancy, Russ, and Mark. 2017, Memorial Day Parades in Berne and Knox, and 911 ceremony in Knox. September 11, 2016, Amy, Heather, Gerry, Mark, Russ, and Nathan played at the 9-11 memorial at the Knox Fire House. May 30, Memorial Day 2016, Stacey, Amy, Dan, Nathan, and Russ played in the Berne and Knox parades, with Gerry Chartier pulling the float. Little League opening day, 2014, we played the National Anthem. 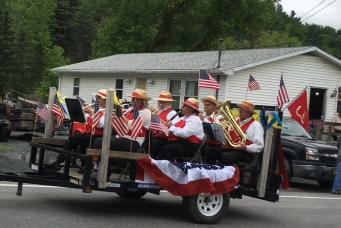 Memorial day 2013 we played for the Berne Knox parade. 9/11 2014, we played for the ceremony at the firehouse in Knox. December 1, 2012, 5 to 6 pm, Nancy and Bill played for the Salvation Army Bell Ringers, Lou and Jack, at the 20 Mall Price Chopper. 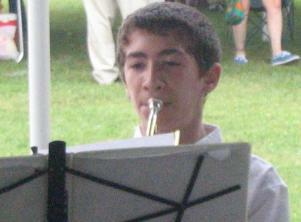 September 11, 2012, we played for the Knox 9-11 ceremony at the Knox Fire House. 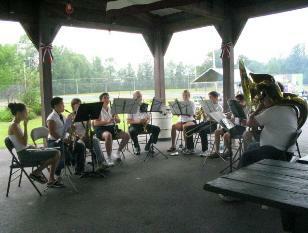 September 11, 2011, we played at the Knox 9-11 ceremony at the Knox Fire House. May 31, 2010, Memorial Day, Nancy, Amy, Heather, Dan, Russ, Gerry, and Nathan played on the Youth Float in the Berne and Knox parades. 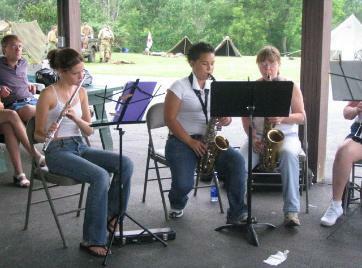 September 11, 2009, we played at the Knox 9-11 ceremony at the Knox Fire House. July 12, 2009, Sunday afternoon Dan, Nathan, Nancy, Amy, Heather, and Russ played on the Museum Porch in Knox for the Historical Society. We played for more than an hour and had a very nice audience. May, 25th, 2009, Memorial Day, Nancy, Gerry, Dan, Heather, and Russ played on the Youth Float in the Berne and Knox parades. December 20, 2008, at 2 pm, Gerry and Dan played for the bell ringers outside Macy's at Crossgates. 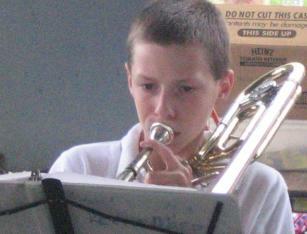 September 11, 2008, we played for the 911 ceremony. 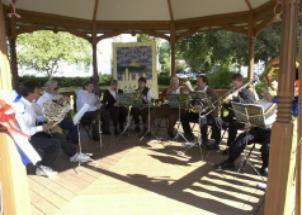 We played Sundays during August, 2008, at 2 pm on the porch of the Knox Museum. 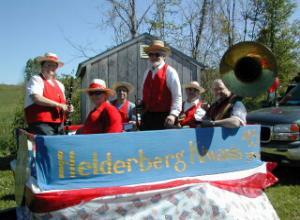 May 10, 2008, 3 pm, Dan, Nancy, Amy, and Russ practiced at the Octagon Barn for the Memorial Day parade. December 22nd, 2007, at 2 pm, Dan, Nancy, Gerry, and Bud played at Crossgates Mall for the Masonic Salvation Army Bell Ringers. December 15th, 2007, some of us played for the Masonic Salvation Army Bell Ringers, more information to follow. December 8th, 2007, at 2 pm at the 20 Mall, some of us played for the Masonic Salvation Army Bell Ringers. September 11, 2007, Tuesday evening, Nancy, Dan, Amy, Eric, and Gerry played at the 9/11 ceremony. August 12, August 19, and August 26, Sundays, 2007, we played on the porch at the Knox Museum. we switched to flute, fiddle, and whistle. We were joined by Maureen and Mary, along with a few other visitors to the museum. riding on the Youth Commission float. August 27, 2006, Sunday, at 2 pm, Nancy, Eric, Dan, and Russ played at the Knox Museum, while Mary provided moral support. August 20, 2006, Sunday, at 2 pm, Nancy, and Kevin, played at the Knox Museum, while Mary provided moral support. August 13, 2006, Sunday, at 2 pm, Nancy, Kevin, and Russ played at the Knox Museum, while Mary and Cheryl provided moral support. August 6, 2006, Sunday, at 2 pm, Nancy, Eric, Kevin, and Russ played at the Knox Museum, while Mary provided moral support. 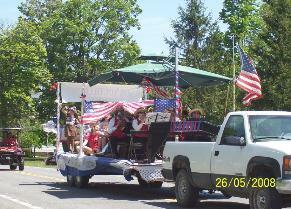 May 29, 2006, Monday, we played in the Kiwanis Memorial Day Parade, riding on the Youth Commission Float. Avenue in Guilderland. 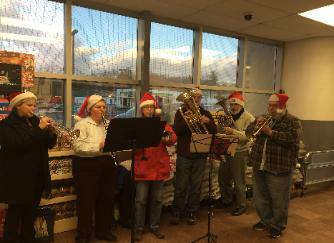 We played some marches, patriotic tunes, and Christmas carols, and were very well received. January 7th, 2006, Saturday, Nancy, Kevin, Kyle, Eric, Rebecca, Mark, Dan, Gerry, Rod, and Russ practiced at the Octagon Barn. Saturday, September 24th, we practiced at the Octagon Barn. September 11, 2005 we played in Knox for the 9-11 commemoration. August, 2005, Sundays, at 2:30 pm, we played on the Museum porch in Knox. 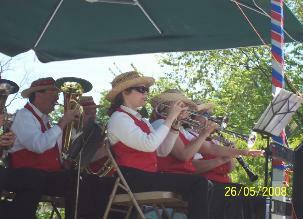 July 16th, 2005 at noon, and again later in the afternoon, we played for Berne Heritage Days. On Sunday, May 12th, at 2:30 pm we practiced at the Octagon Barn. 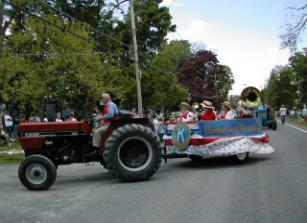 On Monday, May 30th, 2005, we played in the Memorial Day Parade on the Kiwanis Float. On Sunday, May 22th, 2005, at 2:30 pm we practiced at the Octagon Barn. On Sunday, May 15th, 2005, at 2:30 pm we practiced at the Octagon Barn. On Sunday, May 1st, 2005, at 2:30 pm we practiced at the Octagon Barn. On Sunday, April 17th, 2005, at 2:30 pm we practiced at the Octagon Barn. On December 24, 2004, we played for the Christmas eve service at the Knox Reformed Church. 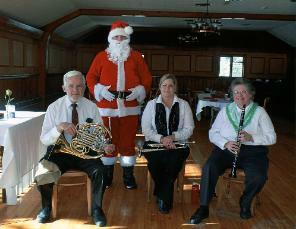 On Sunday, December 19, Brian, Mary, Mark, Heather, and Russ practiced at the Octagon Barn. 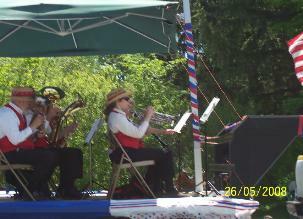 We played at the 9-11 ceremony in Knox on Saturday September 11, 2004. 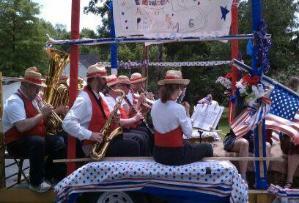 We played on the Knox Youth Commission Float for the 2004 Memorial Day Parade. We practiced at the Octagon Barn on Saturday May 15th at 1 pm. Heather, Amy, Mary, Brian, Gerry, Daniel, Mark, and Russ practiced at the Octagon Barn on Middle Road on Sunday, May 2 at 2 pm. Dan, Heather, Amy and Russ practiced at the octagon Barn on Middle Road on Saturday April 24 at 1:30 pm. then some to a very appreciative audience including Si Stevens. On Christmas Eve, at 9 pm, we played for the Knox Reformed Church Service. Nobis Pacem in parts. We are a choir now as well as a band. On Wednesday, November 26th (Thanksgiving eve), we played at the Thompson’s Lake Church. On Sunday, November 16th, at 4 pm, we practiced at the church. We decided we were going to try to play Sunday afternoons at 2:30 pm on the museum steps during the month of August 2003. On the 3rd, Mark, Daniel, and Mary played. On the 10th, Dan, Brian, Russ and Amy played. On the 17th, Mary, Brian, Mark, Amy, and Russ played. On the 24th….. no plan to meet. On the 31st, we played at the Guilderland Nursing Home for Si Steven’s 77th birthday party. their lovely old barn and beer as well. we moved down the road to Ella and Wally Quay’s and set up in their side yard and played a few tunes. and straw hats, may have helped to win the FIRST PLACE Prize. Saturday evening, February 8th, 2003, from 5-8 pm, we will be playing some of our tunes at the Kiwanis Club Spaghetti Dinner at Camp Pinnacle. Sunday, January 26th, 2003, at 2:30 pm we will be practicing at the church…. hospitality and lots of good food. Sunday, December 27th, 2002, we went “caroling”, playing at the Guilderland Nursing Home and at the Guilderland Center Nursing Home. Jesse, Yana, and Luke sang along with us. Wednesday, November 27, 2002, we played for the Thompson’s Lake Reformed Church Thanksgiving Eve service at 7:30 pm. Sunday morning, November 3th, 2002, we played for the morning worship service at the Knox Reformed Church. finish in the Float Division. We performed on Easter Sunday morning, 2002, at the Knox Reformed Church Service at 11:00 am. Nancy. Back row, Dan, Russ, and Gerry. 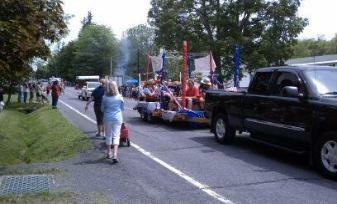 Memorial Day 2012, Youth Float pulled by Ed Schmidt.